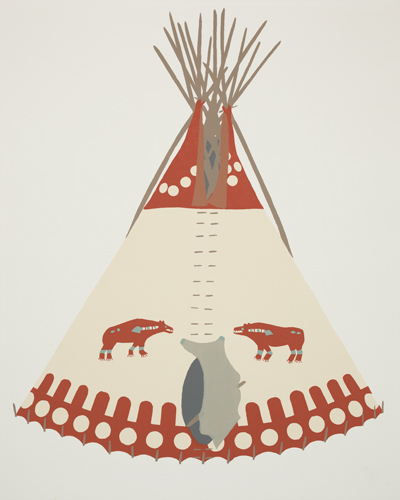 The painted tipi was an important traditional art form among most American Indian Plains tribes; but with the destruction of the great buffalo herds in the latter part of the 19th country, and the change from buffalo cow-hide tipis to canvas tipis, the tradition died out except among the Blackfeet. The tipis were of religious significance, being part of a complex of sacred objects, rituals, and taboos surrounding the American Indian owners as long as they possessed the tipis. According to the origin legends, many painted tipis were given to their first American Indian owners in dreams or visions. Blackfeet Indian Tipis: Design and Legend is a portfolio of twenty-six tipis, of which a selection is on view, that were observed at one time or another of the encampments of the Blackfeet or Blood Reserves in 1944 or 45, at the time of the annual Sun Dance in early July. In producing the silkscreen plates for this collection, every effort was made to show the tipis as they were in the mid-1940s when the original data was collected. 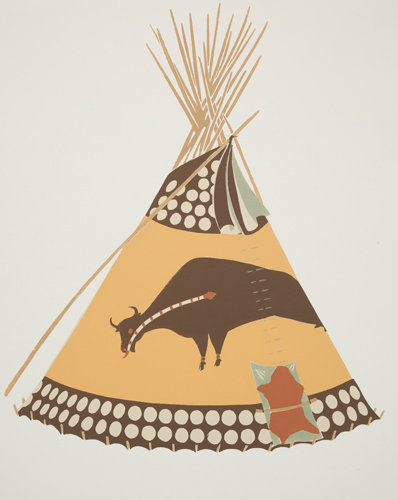 Blackfeet Indian Tipis: Design and Legend premiers this new exhibition available through the Art Museum’s Regional Touring Exhibition Service. It is available for travel across the state in the fall.